The following article about growing cashew trees and other tropical fruit trees originally appeared under the title "It's all in the flavour" on Claire Valente's highly readable blog "Luardeprata's Webblog". Claire graciously offered me to republish it here. Four years ago Claire moved from England to Brazil where, as she explained to me, she has "been trying, with some success to grow things on sand (we live by the sea) in year round high temperatures." Four years ago, our garden was not much more than a bare patch of parched, white sand. Neu had planted a few trees while the house was being built, and some of them, like the coconut palms, cashew and guava trees, were pretty well established by the time I moved out with the children. Now many of those first trees are producing fruit and the garden is ever greener, but as I am keen to try and grow as much food for us as possible, we need more shade, lots more. To combine shade and food, we planted many more fruit trees. Papaya, Banana, Acerola, Sapote, Mango, Caja, Tangerine, Lime, Barbados Almond, Sweetsop, and Siriguela. The acerolas are a fantastic way to boost your vitamin c intake, they make great juice and combine really well with lime to make refreshing sorbet. The guava trees have given us several marvellous crops, they are delicious eaten straight from the tree, made into juice or into ice-cream. We get some bananas, though I'm not sure if its the variety we have or just that they don't much like the position they are in, but they produce the tiniest bananas I've ever seen, about 10cm long. What they lack in size, they make up for in flavour. Siriguela is another fruit that was new to me. The fruit, like a small, elongated plum, ripens to a brilliant orange. Neu likes to eat them while they are still green, when the flesh is harder and the flavour sharp. I prefer to eat them fully ripe, when they are orange, soft and sweet. The tree that captures me the most is the cashew, in the first year that it produced fruit we got just one. As the fruit swelled it gradually changed colour from deep green to bright yellow, until it hung there, lone and splendid, reminiscent of a capsicum pepper but with the cashew nut in it's kidney shaped casing, hanging beneath. It reminded me of the fairy stories I loved as a child, a magical lone fruit on a tree, golden and wickedly inviting. I became slightly unsettled at the idea of picking it but, as in the fairy stories, I was desperate to taste the beautiful looking fruit. Risking the consequences, I picked it, the fruit yielding slightly in my hand, drops of juice forming on the soft, waxy skin, it was perfectly ripe, ready for eating. Sharing it between us all, we were delighted to find the flavour sweet and light, only disappointed there wasn't more. The fruits vary greatly in their colours, from deep red through varying shades of orange to bright yellow, and just as their colour differs, so does their flavour. They can be anything from delicately sweet, through to grabbing you by the back of the throat and burning until you cough and cough. 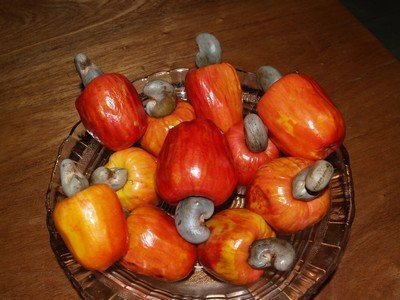 Picking wild cashew fruit is always a bit of a gamble, until you learn which tree is the one to go for. 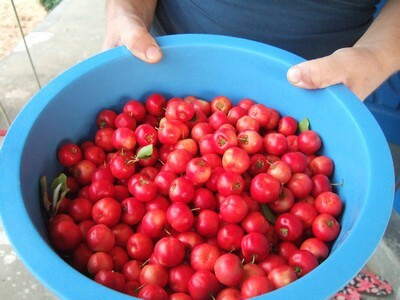 Each fruit contains a river of juice, eating them is a case of slurping and sucking as you chew, and cashew juice is a valuable commercial product. Cashews contain an acid in the husk around the nut, its strong enough to burn your skin which is why you never see the nuts for sale in their outer coating. One young man visiting here from France told me he hadn't known about the acid and had bitten into a husk, the acid burnt his tongue so badly that he lost a layer of skin, painful. To open the shells and avoid the acid, we roast the nuts on a fire until the casing is blackened, then wait for them to cool just enough, before hammering the shells to get the nuts out. It takes time, no wonder they are so expensive to buy. Last year our cashew was more productive, each fruit as deliciously sweet as the first. Now we are waiting for this years crop, checking the tree daily for signs of the nut casing, the first part of the fruit to appear. So far we have only had two fruit, and one of those fell off before it was ripe. Neu took it as a personal insult, especially as his family keep telling us our tree is no good, that it doesn't produce enough. I think its just very young, and hope that each year it will gradually produce more.